This Tutankhamun Timeline has been developed to provide a 'snapshot' of the famous people and events during this historical time period featuring the Tutankhamun Timeline. Important dates in a fast, comprehensive, chronological, or date order providing an actual sequence of important past events which were of considerable significance to the famous people involved in this time period via the Tutankhamun Timeline. The Ancient Egyptians believed that as long as a pharaoh's name was remembered, the king would live on through eternity. Tutankhamun was a minor King. 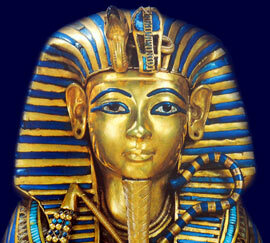 The Tutankhamun Timeline shows that he died when he was only nineteen years old. But the discovery of the tomb of Tutankhamun and its fabulous wealth has made Tutankhamun one of the most famous Ancient Egyptian Pharaohs and why the Tutankhamun Timeline is so interesting. 1330 BC King Tutankhamun, Queen Ankhesenpaaten and the royal court, moved back to the old capital at Thebes, the center of worship of the Ancient Egyptian god Amun and the power base of the Amun priests. 1325 BC The marriage of Tutankhamun and Ankhesenpaaten produced two daughters who were stillborn. 1922 26 November 1922: Carter makes the famous "tiny breach in the top left hand corner" of the tomb doorway accompanied by Lord Carnarvon and his daughter Lady Evelyn Herbert. Carnarvon asks him if he can see anything, Carter replied: "Yes, wonderful things" and goes on to say: "as my eyes grew accustomed to the light, details of the room within emerged slowly from the mist, strange animals, statues, and gold--everywhere the glint of gold." Each section of this Tutankhamun website addresses all topics and provides interesting facts and information about the Golden Age of Pharaohs and of Egypt including this Tutankhamun Timeline. The Sitemap provides full details of all of the information and facts provided about the fascinating subject of this famous Pharaoh via the Tutankhamun Timeline.